The Aluminum Catamaran of Exploration Garcia Yachts is delighted to announce the start of production of the very first Explocat 52 catamaran. Born from a close collaboration between naval architect Pierre Delion, designer Franck Darnet and the Garcia Yachts teams, the Explocat 52 has been designed to open up new perspectives for lovers of sailing in all regions, hot and cold. In line with the Garcia Exploration range, the Explocat 52 is dedicated to adventure in all latitudes, off the beaten path. It makes it possible to undertake long passages, those where it will be necessary to negotiate different weather systems in ultimate comfort. Unparalleled on the market, it meets a set of specifications that considerably opens up new geographical scope: • Passage through the sea optimized by the management and distribution of weight as well as the bridgedeck clearance, • Strength and robustness of aluminium which increases the safety margin when sailing in unfamiliar areas, and ensures excellent rigidity to the platform, • Optimal crew protection with interior helm station and sheltered sail manoeuvring position, • And interior fittings to Garcia Yachts standards combining functionality, ergonomics, use of noble materials and a high standard of finish. 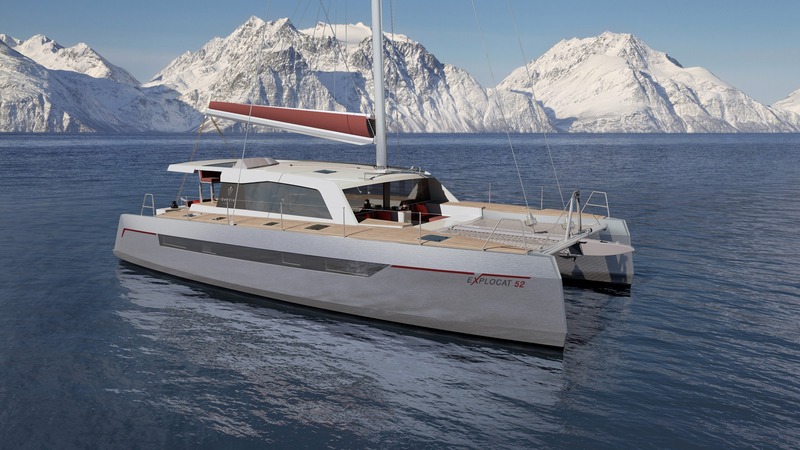 The Garcia Yachts shipyard teams will be present at the International Multihull Boat Show, from 24 to 28 April 2019 at La Grande-Motte. You too, try the adventure and make an appointment now!